Christmas 2014 saw UK High Street spend reach £74.261 billion, up 2.9% on the year previous. It’s a trend that’s hopefully going to continue this year but to ensure you get your fair (hopefully more) share of the spend, you have to stand out from the competitors all around you. That’s often easier said than done, but one simple tactic is to employ unique point of sale signage. 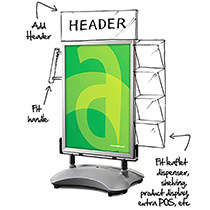 Here at Assigns we already have a vast selection of signs, from simple A-boards and forecourt signs right through to technologically advanced light boxes, and the majority can be modified, or even redesigned, to fulfil your every requirement. Sometimes you see a product that’s almost perfect, but just not quite. With a large standard product range to use as a starting point, quite often small modifications and simple ideas can make a huge difference to the impact of a product and its success. Our customisation process is where we decide upon minor amendments to the design or structure to suit your needs. If the design needs larger scale revisions, Assigns can help you define a brief and specification, produce design concepts and prototypes and develop a solution that meets all of your requirements. With over 100,000 square feet of manufacturing and warehousing across our group, we have all the capacity we need to make sure your project gets the attention it deserves. From design to prototype, manufacture to roll out, large project or small, Assigns provide a comprehensive service from beginning to end. Make the most of what is likely to be one of the most profitable Christmases on record, and extend your reach with a bespoke sign. Click here to see our full range.